First up in this line up of notorious villains is a poisonous green fruit by the name of manchineel, also known as “the death apple,” which when consumed has the violent effect of leaving its victim with a burning throat and lips. The sap of the manchineel is more poisonous than the fruit, and if you happen to pass under a manchineel tree after or during a rain, you can get the equivalent of acid burns on your skin from the sap runoff, or if it somehow gets into your eyes, it can cause blindness. Ironically, another poisonous plant is the BVI national flower—oleander that grows everywhere. Next in the rogue’s gallery is the venom of a brown recluse spider. The name “brown recluse” is not a misnomer. The spiders tend to hide out and only defensively respond with their harmful bite if threatened. A small bite can potentially swell to the size of half a golf ball if untreated. The small spiders are recognisable by the violin-shaped marking on their backs. To all BVI residents new and old, it’s recommended out of caution to check your shoes before putting them on and shaking your sheets before bed. There are plenty of edible plants and fruits in the BVI. Some favourites include golden apples, papaya, avocado and breadfruit and not to forget the pleasure of having a ripe mango fall from the tree when you walk by. Coconut water is also a local preference, but some find it to be an acquired taste. Also, don’t fret over every creepy crawler that crosses your path. Although a whip scorpion looks unpleasant, the gigantic arachnid completely lacks the venom and bite expected. It’s special power? It can secrete a vinegar-like mist that may cause slight discomfort if inhaled. Aedes aegypti, the only mosquito that acts as a vector for the dengue virus, recognisable by the white stripes on its black legs and body, dwells in enclosed, human-inhabited, indoor spaces and breeds in places where water collects. They seem to be everywhere in the BVI. The best way to keep the mozzie population under control is by not giving larvae a place to grow. Some pointers to keep in mind include sealing cisterns, cleaning gutters and pets’ water bowls every week and turning over any container that could collect water after rainfall. Sand flies, or no-see-ums, are tiny black bugs that mostly inhabit coastal areas and are prevalent around sunset, sunrise or in the shade. The biters can hurt, and an allergic reaction can cause red bumps similar to mosquito bites. The best way to treat bites from either mosquitoes or sand flies is with hydrocortisone cream or an oral antihistamine to combat the allergic reaction. After a few months, most newbies seem to become immune to the mosquitoes and bites cause less of an allergic reaction (or maybe the bugs have just moved onto fresh blood). Another mosquito predator, bats are prevalent in the BVI. Again, they are harmless to humans, and if one gets in the house, simply trap it in a towel and release it outside. Most BVI residents don’t need alarm clocks when roosters are happy to serve the purpose. The only problem is that the strutting birds don’t seem to be able to tell time and tend to screech their distinctive call at all hours of the day and night. But don’t worry, you’ll get used to it after a few weeks. These cute little primates, with their ringed tails and beady eyes, were controversially imported to the BVI in 2010 by Sir Richard Branson – he moved them to his home base at Necker Island. Sir Richard contends that the endangered species have found a fertile playing and breeding ground in the BVI. Others have questioned what implications the introduction of the Madagascar-born species will have on the environment. We’re hoping that Sir Richie’s got this under control. But should you see a lemur (not known for their swimming capabilities) attempting to hitch a ride to Tortola or Virgin Gorda, go against proper BVI etiquette and respectfully reject the temptation to give the cuddly critter a lift. 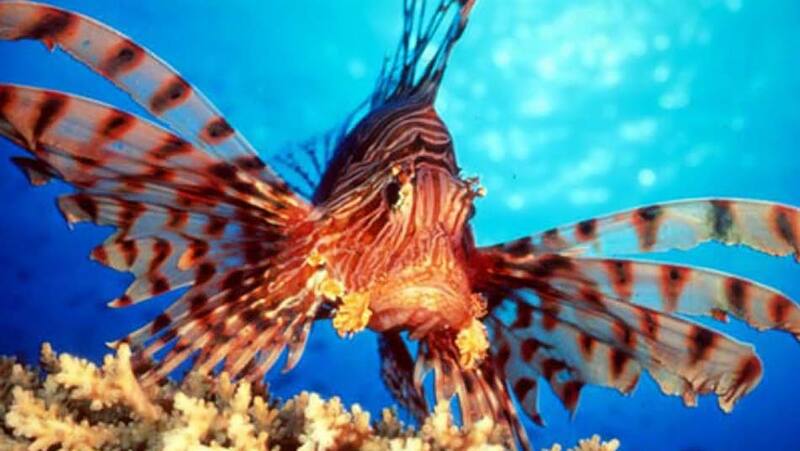 Lionfish are considered enemy No. 1 among the Virgin Islands’ intricate reef systems. In fact, dive operators and fishermen throughout the Caribbean are actively pursuing the invasive little creature. It’s presumed that it originally first escaped from a Florida aquarium in the 1990s, soon breading and flooding the waters from the Bahamas to the Cayman Islands. The predator fish, native to the Pacific Ocean, was first sighted in the BVI in March 2010. Since that time, the problem has grown exponentially. The invasive fish currently has no known predators on this side of the globe, and have terrorised the waters’ marine life ecosystem without repercussion. Lionfish are a beautiful species, with wild and flowing fins and intriguing tiger stipe patterns running along their bodies, and typically grow from 12 to 15 inches in length. Large, poisonous spines protect the fish from potential predators, and should be avoided at all costs. While Conservation and Fisheries Department officials encourage fishermen and professional divers to hunt the creatures, nautical newbies are asked to steer clear of the fish and contact authorities if sighted.